The first church dedicated to Our Lady by Saint Peter the Apostle was not actually in Italy, as the good abbot stated, but in the city of Tartus, Syria. The city of Tartus was known as Tortosa to the Crusaders who lived in the region during the time of the Crusades. The Cathedral of Our Lady of Tortosa, built in the year 1123 by these Crusaders, still stands on the site of the original sanctuary of the Blessed Virgin that was dedicated by Saint Peter. It is remembered that the Emperor Constantine looked favorably upon the city because of his love for the Blessed Virgin Mary and the devotion to her by the faithful at Tortosa. According to tradition, it is the place where St. Peter was ordained. By all appearances the church of Our Lady was as much of a fortress as it was a church, and indeed there were once towers surrounding the structure, two of which have survived the centuries. The façade of the church, which appears almost Romanesque in style, has five arched window openings that are well above ground level, and there is a centrally located doorway. Once inside, however, the structure looks more like a church, as there are graceful arches, columns and a vaulted ceiling. It is thought by many historians to be the best-preserved structure of a religious nature dating from the time of the crusades. Since the church doubled as a fortification, the Crusaders were able to hold it even after Tortosa was taken by Saladin in the year 1188. Saladin, who was able to unify the warring Muslim factions, made them into a robust army and won an important battle at Hattin over the Crusaders, capturing nearly all of their holdings, save for those near the coasts. The Knights Templar continued to use the church as a kind of headquarters until the year 1291, when it was also taken. Once captured by the Mameluke’s, the church was turned into a mosque. 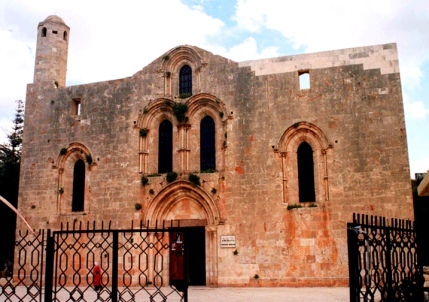 Later, under the Ottoman Empire, the church was used as a place of storage. The church was recently renovated, although now it is used only as a museum.